The popularity of barbecue has continued to grow and evolve over the centuries. There are different interesting stories relating to the evolution and history of barbecue in different parts of the world. Interestingly, according to historical evidence, the concept of barbecue appears to be as old as that of the human civilization. Those looking to find out who started BBQ may be surprised to know that cooked meat was tested for the first time ever by Homo erectus, an extinct humonid species that lived between 1.9 million years and 70,000 years ago. It is said that these proto-humans got attracted by the aroma of a charred wild boar following a forest fire. The extraordinary taste of roasted meat was an instant favorite amongst the Homo erectus. Experts suggest that their liking for burnt meat had a serious impact on the evolution of these pre-historic humans. In the year 2007, a group of scientists at Israel’s University of Haifa revealed evidences of barbecue being a common practice in the Carmel region around 200,000 years ago. Tool and bone evidences suggest that they preferred animals that were large and mature with plenty of flesh. Evidences also suggest that these cave dwellers knew how to cook food just by using fire. Interestingly, may be the first ever detailed design of a barbecue can be seen in the Hebrew Old Testament. Written between 1300 and 1500 years before Christ’s birth, the chapter 27 in Exodus mentions a 4.5 feet high and about 7.5 feet long design with fire pans, fleshooks, shovels, ash pans, a grate, basins, and tie downs. It was a portable design with poles on each of the sides. Based on their extensive studies, some scholars believe that the technique for roasting meat in low and slow smoke was invented in China. English humorist and essayist Charles Lamb has written in detail about barbecue in ancient China in his writing “A Dissertation Upon Roast Pig.” Similarly, in India, there is a century old tradition of cooking over tandoor, a special type of ceramic urn. Ceramic cooking urns called Kamado have been operational in Japan since no less than 3,000 years. England has a long tradition of being a country that loves beef. It is said that the Englishmen started roasting in an oven way back in the Middle Ages. The innovative concept of the “turnspit dog” was mentioned in the print media for the first time in 1576. As per written documentation, the history of French meat roasters dates back to 1248. It is relevant to note here that Chaîne des Rôtisseurs, the international gastronomic society, is based completely on the practices and traditions of the professional French meat roasters. The Check and German culinary tradition will remain incomplete without the mention of grilled and smoked pork and sausage. Also, these influences are extremely strong in the barbecue traditions of Texas and Carolina, the US states with a high percentage of German and Check migrants. The Spanish Empire played an undeniable role as far as the foundation of the modern-day barbecue in the United States is concerned. During their exploration of North America, Central America, South America, and Mexico, the Spaniards brought cattle, sheep, goat, hogs, and the idea of spit roasting to this region that they called the New World. Starting from 1492, Christopher Columbus made as many as four voyages to the New World from Spain. As per available documents, the Arawaks were the first tribes encountered by the Spaniards. The favorite cooking method of the Arawaks was to place the food materials on a wooden frame kept just above the fire. This device was made of green wood to prevent burning and was called barbacoa in the Taino dialect spoken by the Arawak American Indians. During the later part of the seventeenth century, some of the Arawak tribes moved into the southern parts of Florida. By the end of the seventeenth century, Florida got populated with a number of tribes including Apalachee, Timucua, Tocobaga, Calusa, Mayaca, Ais, and Hororo. By this time, most of these tribes had adapted very well to the idea of barbacoa. During the colonial ages, wood used to be the medium for almost all types of cooking. Apart from rotisseries and side ovens, fireplaces and hearths were also used extensively for cooking. A device called roasting jack was also used at this time. This device comprised of a spring mechanism for the rotation of the meat, a drip pan for juice collection, and a rear door. Smokehouses gained popularity amongst the affluent class in the later part of the eighteenth century. This is probably the time when the practice of partying overnight with outdoor cooked meat started. The popularity of this concept initially gained popularity in the southern part of America. Numerous plantations had their own smokehouses for the preservation of meat. Slaves were entrusted with the responsibility of cooking and smokehouse maintenance. In the early part of the 1800s, barbecues were done for the special occasions such as political rallies, reunions, weddings, and July 4 celebrations. The menu mostly comprised of pork and chicken. However, beef, mutton, and fish were also available occasionally. Many of us would be surprised to know that Henry Ford was the man behind the creation of an industry that took barbeque to a new level altogether. In collaboration with EB Kingsford and Thomas Edison, Ford started manufacturing charcoal briquet from his auto plants’ scraps in the 1920s. Documents suggest that the first ever barbecue restaurant was built in 1882 by William J. Moon in Elgin, TX. Later on, he started making smoked meats and sausages for home delivery. The oldest barbecue restaurant to operate continually was opened in New York in 1888 and is still serving in the same location. With changing times and the stringent municipal health laws, the appearance of the barbecue restaurants has changed to a great extent. However, the global appeal for barbecue has only increased with time. 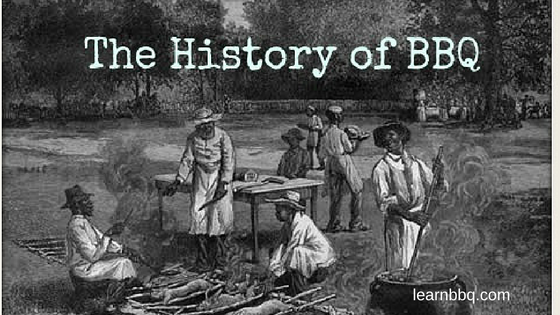 It is never easy to discuss the history of barbecue and how did BBQ start within the limited scope of an article. Hope you liked what you read here, and please do come back for more mouth-watering discussions on barbecue.